Only 10% of people with anxiety or depression received psychological treatments for their problems in 2009, and only 5% had access to an evidence-based therapy such as cognitive behavioural therapy (CBT). These stark statistics prompted the previous Government to instigate a programme to address the severe under-provision of psychological treatments called Improving Access to Psychological Therapies (IAPT). IAPT plans to train almost 4,000 new therapists with the aim of enabling 900,000 more people to access CBT-type treatment. This new study assesses the impact of the IAPT programme to date, and finds that almost half of those referred for therapy did not get further than attending an initial assessment, prompting the authors to conclude that further work is needed to improve the engagement of people experiencing depression and anxiety with the psychological therapies on offer. “Implementation of psychological therapies for anxiety and depression in routine practice: two-year prospective cohort study”, Journal of Affective Disorders, Manuscript Draft, Richards D.
Early intervention or referral to an occupational health service is the key to managing long-term absence, according to this literature review. Other features of a successful approach include the presence of proactive organisational absence management procedures, good communications and cooperation between stakeholders, and the implementation of workplace-based occupational rehabilitation. However, significant contextual factors were also identified, which all potentially affect the effectiveness of absence management, including the degree of support for interventions from senior leaders in the organisation, the organisation’s size and structure, the resources invested in the absence approach and the quality of relationships between managers and staff. In practice: The authors conclude that those with responsibility for managing absence should bear in mind these contextual factors and do what they can to ensure stakeholders, including line managers, have at least a mutual understanding, if not a common purpose, of the organisation’s goals, culture and practice in the management of long-term absence. “Management of long-term sickness absence: a systematic realist review”, Higgins A et al, Journal of Occupational Rehabilitation, first published online 24 March 2012. A new study of 137 employers and 67,347 employees provides evidence to support the validity of the Health and Safety Executive’s (HSE) management standards on stress, and in particular the two indicator tools to measure stress. The results of the study show that both the original 35-item seven-factor stress tool and a shorter 25-item version are valuable and reliable diagnostic instruments for use in public and private organisations, and in employers of varying sizes. “Psychosocial risk assessment: measurement invariance of the UK Health and Safety Executive’s management standards indicator tool across public and private sector organisations”, Edwards JA and Webster S, Work and Stress, published online 22 May 2012. A small study of employees in a group of Indian organisations has highlighted four main causes leading to workplace bullying, including the misuse of positional power. It identified four themes highlighting the impact of bullying, including its impact on motivation and morale, the development of destructive behaviour in an organisation, and the association between bullying and high levels of work stress. “Why do they bully? Bullying behaviour and its implication on the bullied”, Dhar RL, Journal of Workplace Behavioural Health, published online 8 May 2012. Badly implemented organisational change is harmful to employees’ perceptions of their own work ability, according to this study of Finnish social services and health care staff. Employees encountering organisational change were more likely to feel that their work ability had fallen following the change than those not affected by change. Those stating that they did not understand the changes made, or who felt they had not been involved in decision-making, were at the highest risk of reporting a perceived decline in work ability. In practice: The authors advise that it is vital to ensure that employees understand why changes at work are being made, and to give them the opportunity to take part in implementing change if work ability is to be protected. “Work ability of employees in changing social services and health care organisations in Finland”, Kokkinen L and Konu A, International Journal of Occupational Medicine and Environmental Health, vol.25, no.2, pp.151-165. Vocationally oriented CBT is effective in helping the very long-term unemployed, many of whom face serious mental health problems, get back into work. Three months after a CBT intervention, participants in this Australia-based study reported increased optimism and attitudes to work, and more than half had engaged in some kind of paid employment. “Vocationally oriented cognitive behavioural training for the very long-term unemployed”, Rose VK et al, Occupational Medicine, published online 8 May 2012. High physical workload, obesity and engaging in only low to moderate physical activity outside work are all risk factors for the occurrence and course of multi-site musculoskeletal pain (MSP), according to this study of kitchen workers. High physical workload at the beginning of the study was an independent predictor of MSP at the two-year follow-up point even after allowing for age, work-related psychological factors and lifestyle. Smoking had no effect in predicting MSP, the study finds. 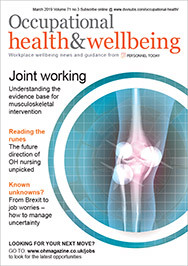 “Physical workload, leisure time physical activity, obesity and smoking as predictors of multi-site musculoskeletal pain: a two-year prospective study of kitchen workers”, Haukka E et al, Occupational & Environmental Medicine, published online first 26 April 2012. Working long hours increases the risk of depression in staff, particularly if job demands are high, according to this study of clerical and sales employees. The odds ratio for the depression risk among those working 60 or more hours a week in high-demand roles is estimated at 2:4 when compared with those working fewer than 60 hours a week in low-demand jobs. “Relationship between long working hours and depression in two working populations: a structural equation model approach”, Takashi A et al, Journal of Occupational and Environmental Medicine, published online 27 April 2012. A retired fitter has received an out-of-court settlement from his former employer after being diagnosed with mesothelioma. The man was exposed to asbestos working in the chemical industry in Billingham in the 1960s and 1970s, where asbestos was used to insulate pipe work.